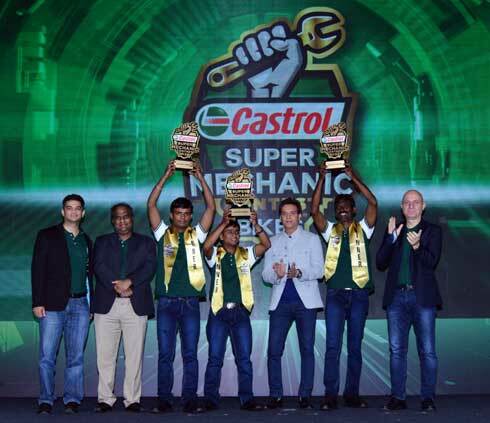 Bangalore: Ratan Khanda, Joseph Peter Rajakumarand Ravish Siddegowda from Bangalore, have emerged winners in the finale of the Castrol Super Mechanic Contest for bikes. Twentyfour mechanics from across the country tested their mettle against each other in a thrilling final event. The winners now get an opportunity to represent India at the Castrol Asia Pacific Bikes Super Mechanic contest to be held in Bangkok in November 2018. The event was a befitting end to the six-month long Castrol Bikes Super Mechanic contest that saw about one lakh mechanics compete at various stages of the competition for the coveted champions title. The contest continued its thrust on upskilling mechanics through personal and group training sessions, technical tips and special boot camps. A unique addition to this year’s contest was the augmentation of the event through ‘Castrol Garage Guru – The Super Mechanic Show’ – a TV programme which covered the contest and had a chat show plus training session with mechanics selected from across the country in each episode. The show, hosted by ace Bollywood actor Jimmy Sheirgill, airs every Sunday, 10.30pm on Zee Anmol till 25 November, 2018.